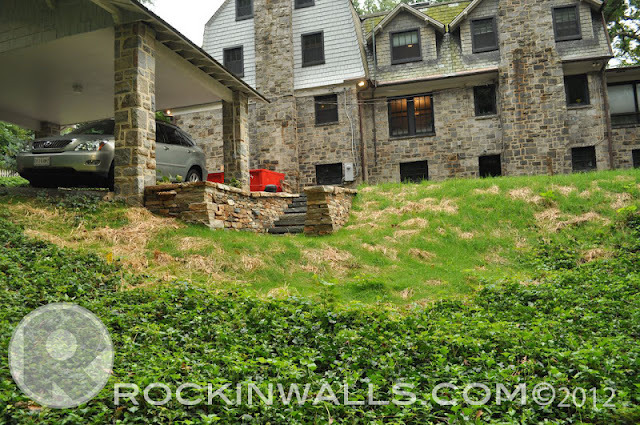 First of the year 2012 I was contacted by Diane and Gail in Roland Park MD. They had a large 100 year old Beech tree which had up rooted their old steps. As seen below. The tree just lifted the wall and steps right up out of the earth. Taking the time to do my homework - my biggest concerns was the existing carport structure. 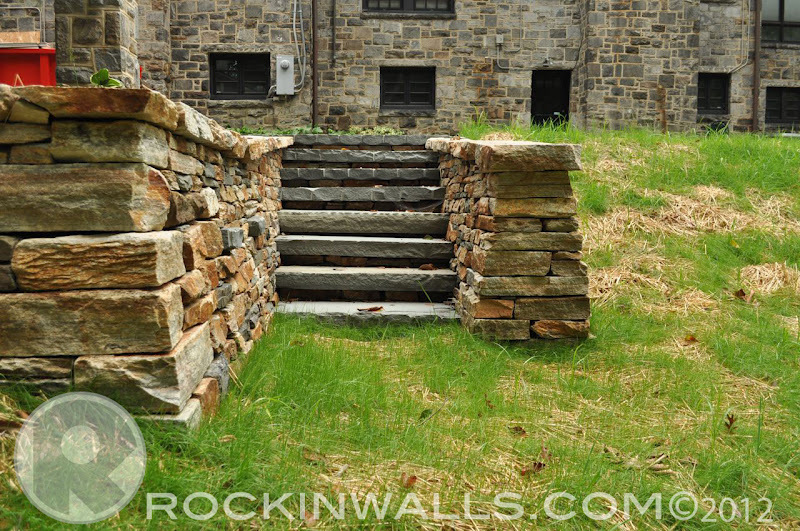 After contacting many of my stone experts along with other experts in construction. I got the thumbs up. If any damage was done it would have already be showing. The build would replace just about everything the way it was with a few changes. 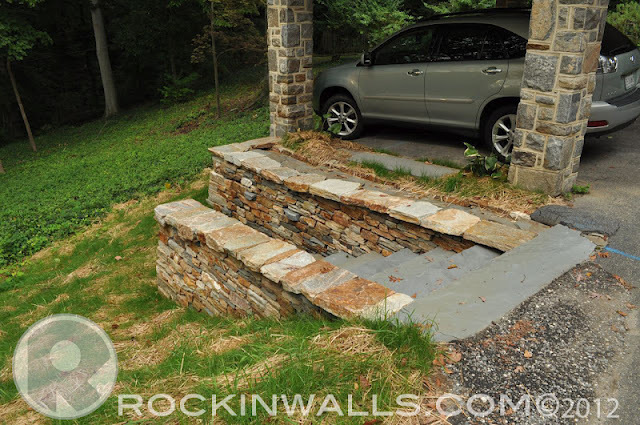 1) move the wall out away from carport. 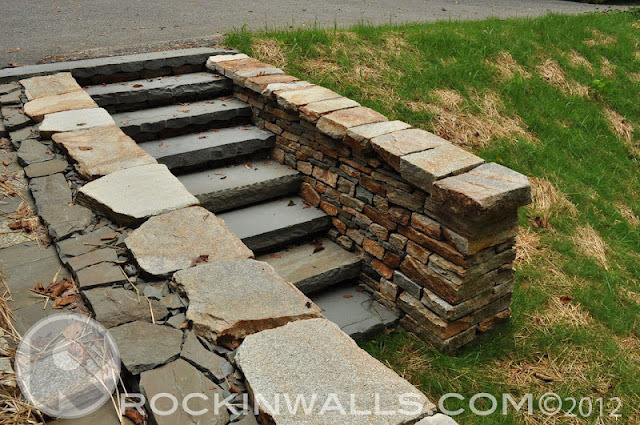 2) larger steps both in length and with a smaller easier step. ( the old wall had 7 steps 2' wide with a 7" rise = height of each step) New steps will be a total of 8 with a 6"rise and 14" tread. 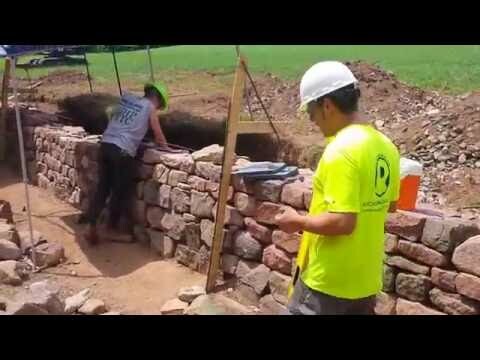 Build the wall with out mortar. The owner had spent a great deal of time reaching there options and found me from the web. 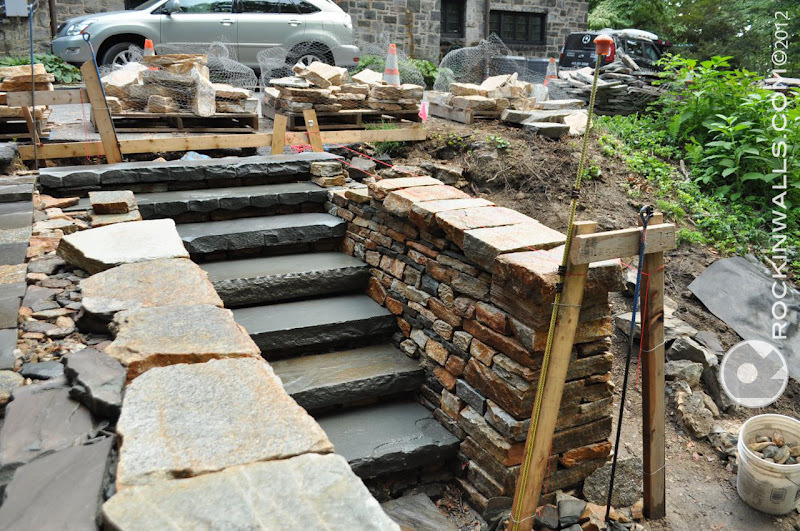 The replaced structure used Butler stone with PA Blue stone and steps. All old the stone was then put back into the new build. 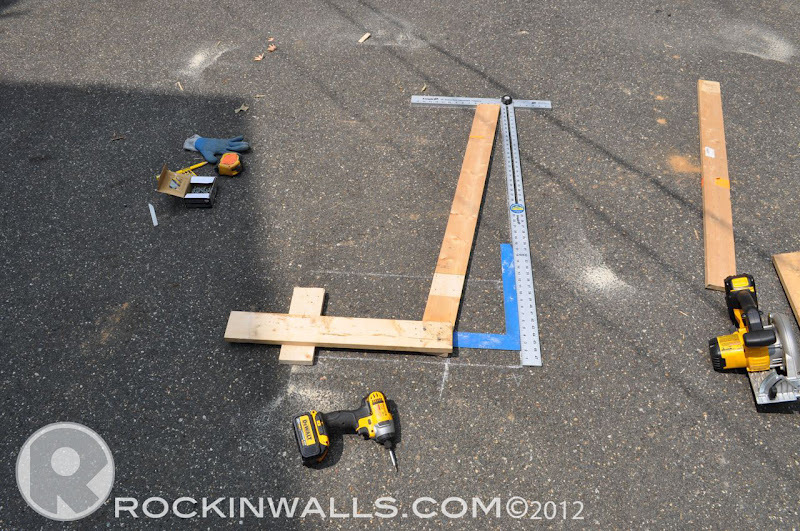 I was able to make 8 steps ranging from 4' - 6' long with slabs ranging from 3"-5" thick. The benefit of the 3"-5" allowed for me to help build my steps up to 6" as needed. As seen later. All stone was gathered taken to the jobsite, stacked and protected by safety cones. The best part of this build was the ability to stock pile all the material on site. 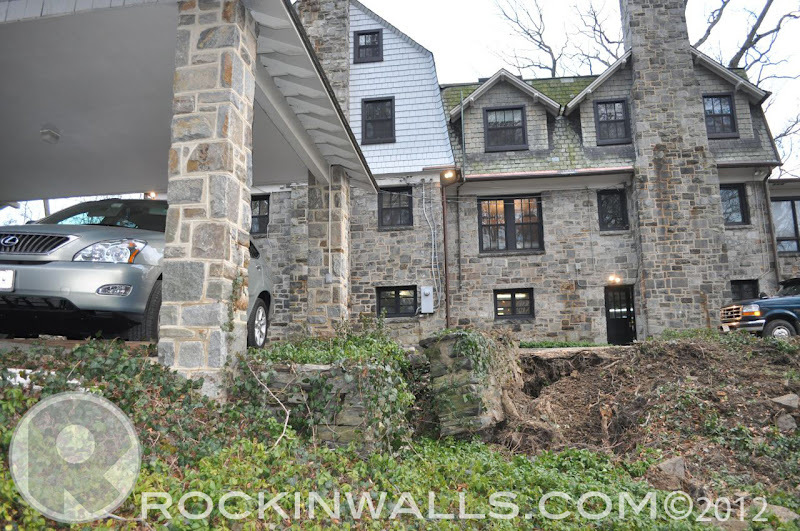 Most homes in Roland Park don't have any driveway. The down side to the job was working over a bank with out any way to get any of my equipment to the lower section. Once all the material was on site I set off to start removing the old wall. 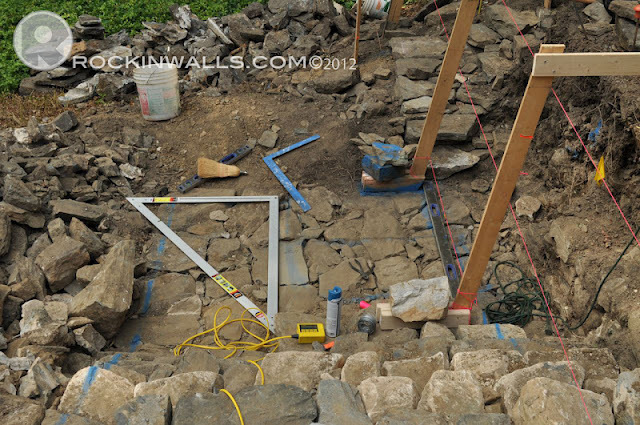 The protruding wall with steps was mortared. 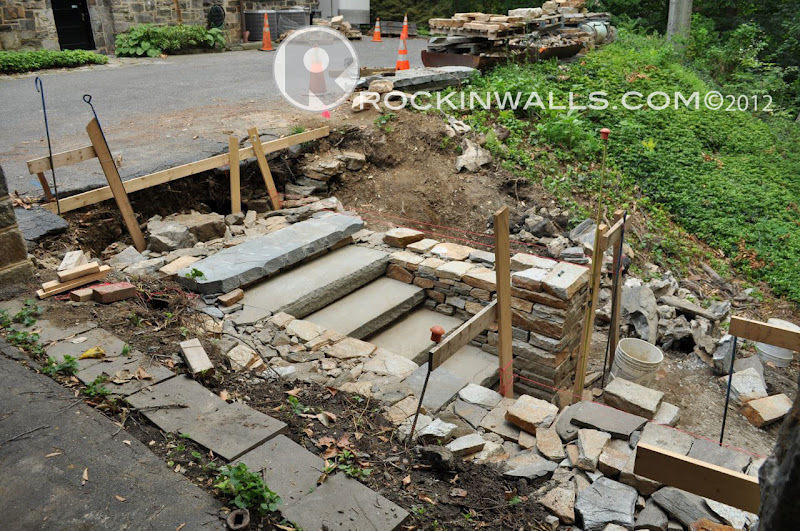 The jack hammer was pulled out to solve this problem. The section by the carport surprisingly was all dry laid. 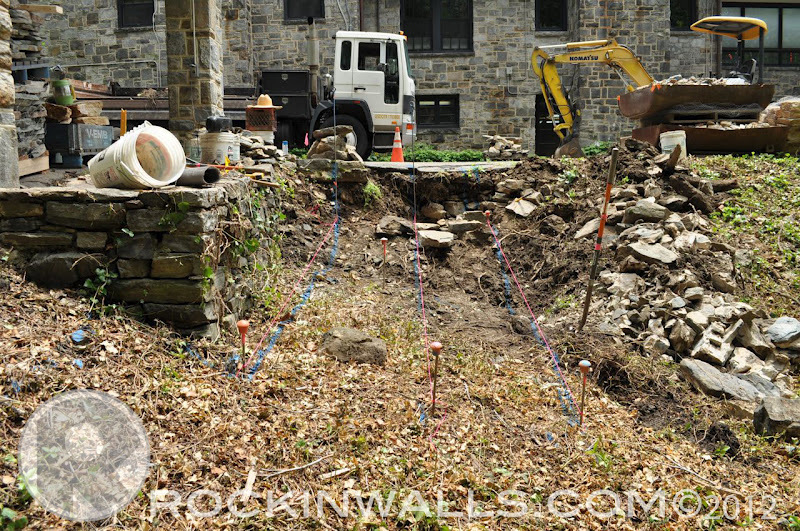 What you might not be able to see unless you really look - notice the YELLOW FLAGS coming up to the retaining wall. GAS LINE - yes of course as you know this is where I tell you "Call be for you Dig" 811 miss utility. If this section of wall was built with mortar I might have been a little stressed out if I had to use the jack hammer any where close to that section of wall. Good news being dry laid - I just had to lift each stone up with my hands move them to existing piles and keep going. Related Blog: What I love about Mortar-My Jack Hammer! With all my old wall stone I set up 2 piles. The one to the left would be away from the free standing wall but close. The other pile I set on a plastic mat to keep the plants from taking over as I was building. The key was to have the piles close but not to close to be in the middle of my rebuild. You want your material to be close if you plan to reuse it. You do not want it in your walk path or your build area. If you have to move it more then twice your wasting time. I set string lines up to help give me a guide in order to see my build. Check and double check to make sure I was on target. Now would be the time to change any plans. Notice safety first - plastic caps on rebar. 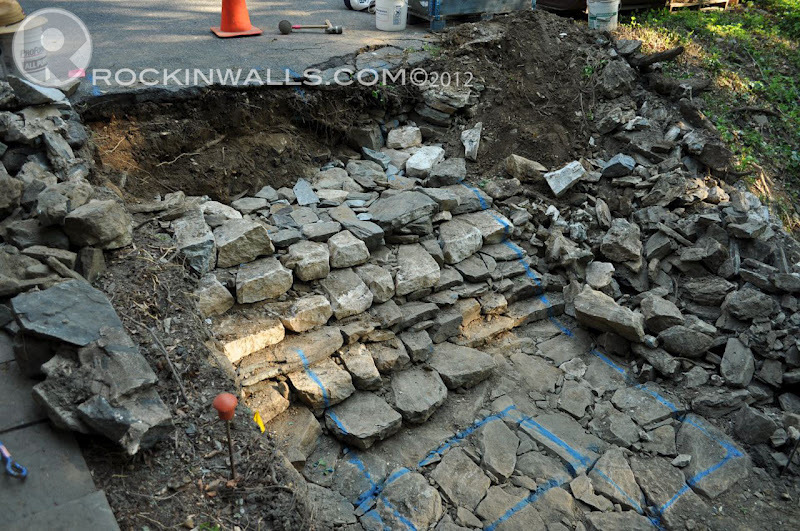 You will also see I have not started to rip out the retaining wall yet! Next photo shows all the stone taken out. The stone left I would build around. 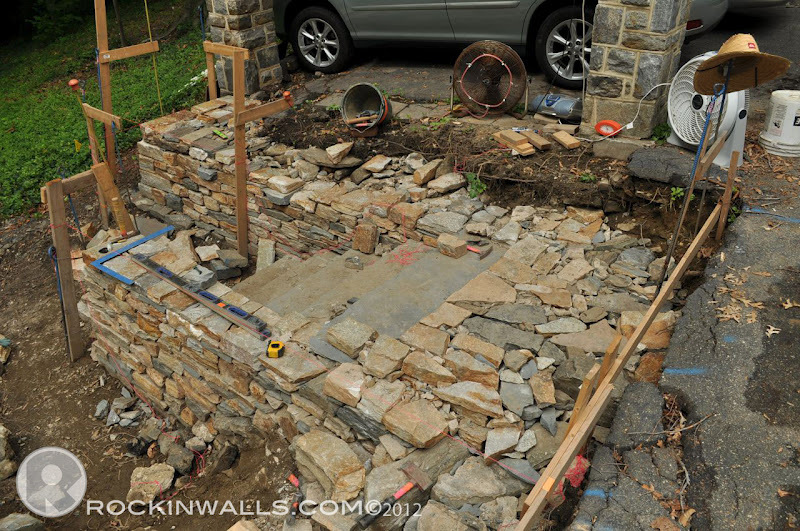 Next I started building my protruding foundation. I started in the bottom center and over in the corner by the column. 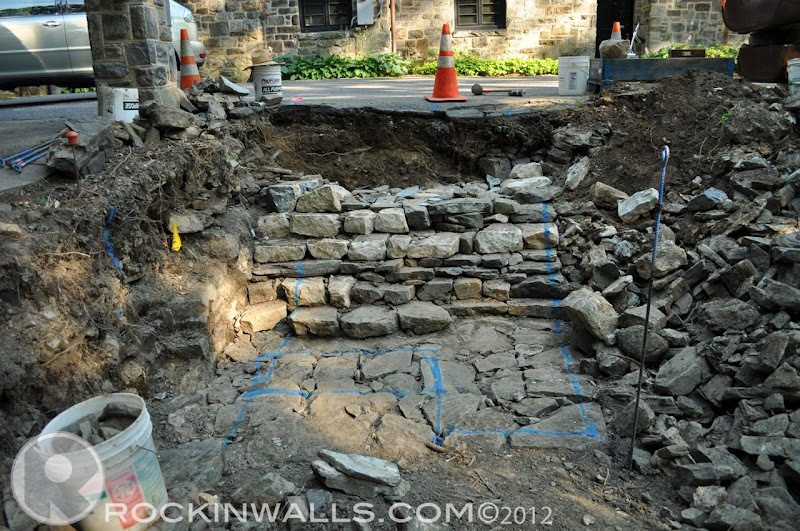 This image above really helps to show the stepped foundation. 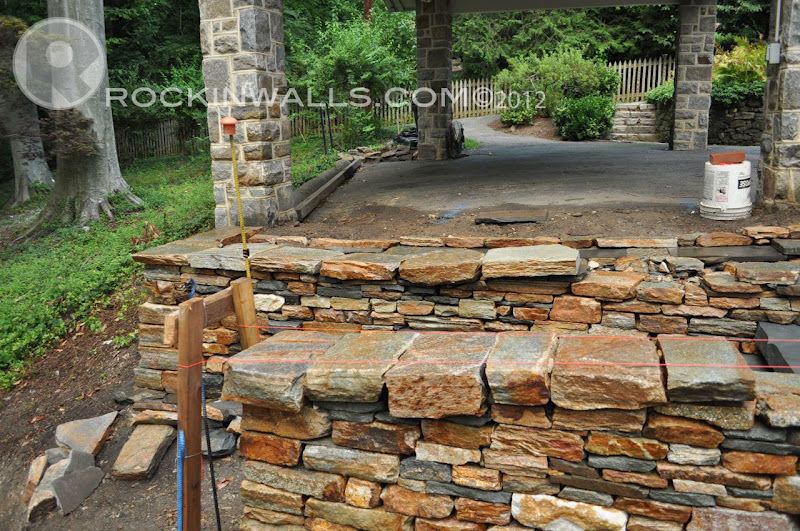 You can also see the stone from the old wall off to the side out of the way but close at hand when I need them for the rebuild. I feel that each and every stone that comes out of the old wall should go back into the new one. Blue marker paint just helps me make sure I'm on target with my plans for the structures. Having a visual helps me see the bigger picture at times. This image shows me building my frames. I used soap stone to make marks on the ground. Then the square helps me determine at what height I need to come in "x" inches at the top to have the correct batter. 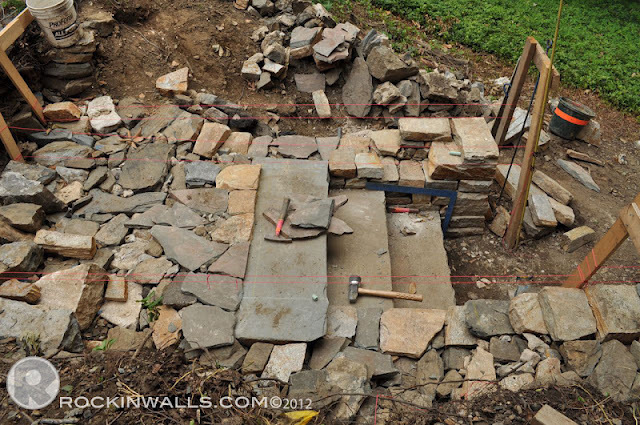 (this wall was built with a 1:6 batter) I might be a little over the top but I prefer to work to the fullest level of accuracy natural stone or not. 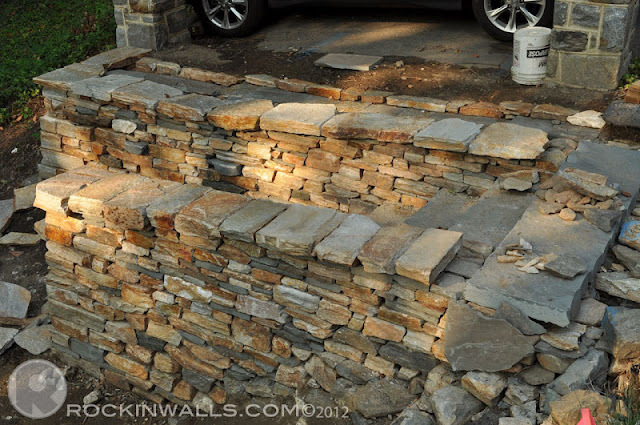 One job I was on the landscape contractor kept saying its natural stone. It might be natural but that doesn't give you a license to do work at subpar levels of the craft?! And these people have work and are taking you hard earned cash to leave you with something many skilled craftsmen will be fixing in no time. SAD and frustrating that home owners don't know any better - in order to spot crappy work. Now I'm setting up my frames off the garage uprights. I'm using this carport to square off from. I set my frames closest to the building. Then I set string lines to measure out from. You will also notice the 3/4/5 square to square up and set my markings for the next group of frames. The zip level helps me determine were my first steps will need to sit. I'm checking right now with the zip level how far below my master line I'm at. Challenges of setting frames can be when you have to keep them all in line. 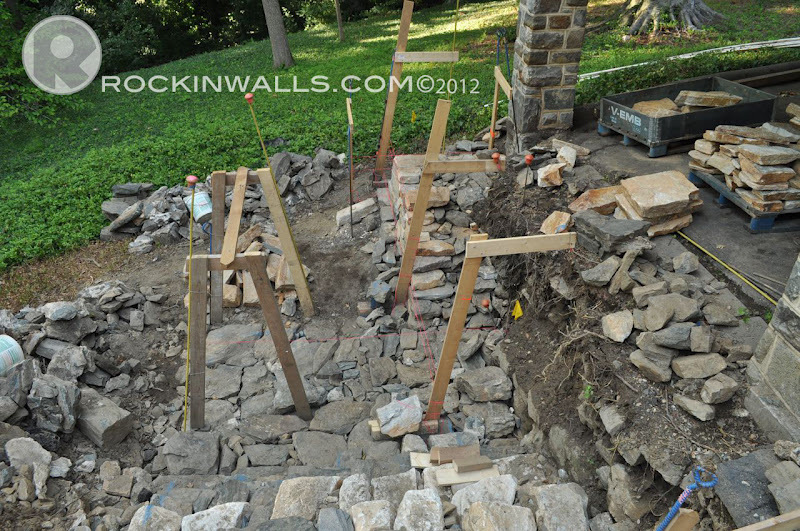 The other is when you need to put frames at a upper levels - then the angles change (notice smallest frame to far right). It might be a little hard to see but by the driveway this wood frame that goes horizontal is my MASTER mark. This is where the top step will go to match the driveway. Some of my wood frames I keep open on the inside. Such as the frames to the left for the retaining wall I don't need a inside frame like those on the right for the freestanding wall. Since the frames are all based off the same 1:6 batter the only thing I need to do in order to set them up is set a level on the top to set the frame at the correct angle. The down side with so many frames are you can easily get lost in them, you can't see our build as well and your bound to trip over one or two at some point. I use rebar to keep them in place. Some I build with legs out and set stones on them. 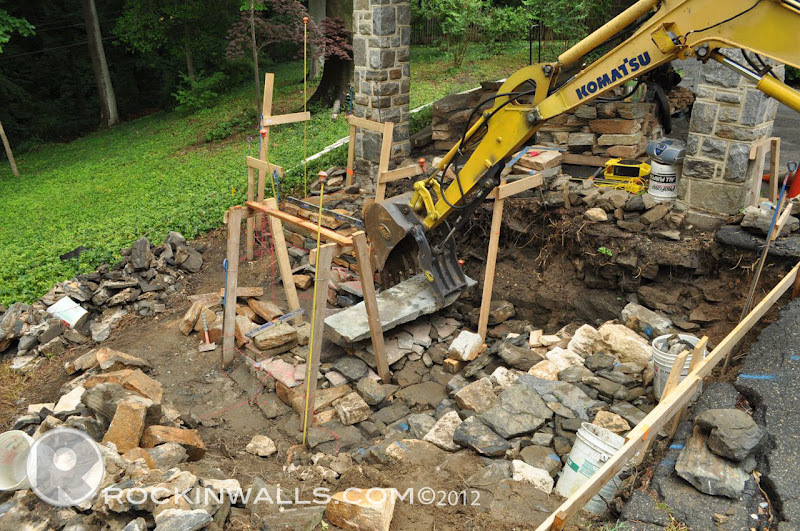 The 3rd frame to the right (on retaining wall) in would be such an example. If you blow the photo up you will see this. Images below also show a better angle. I spent 2 days building my frames along with setting them. I wanted to be 100% on target with my build any error now could cost me a complete rebuild. 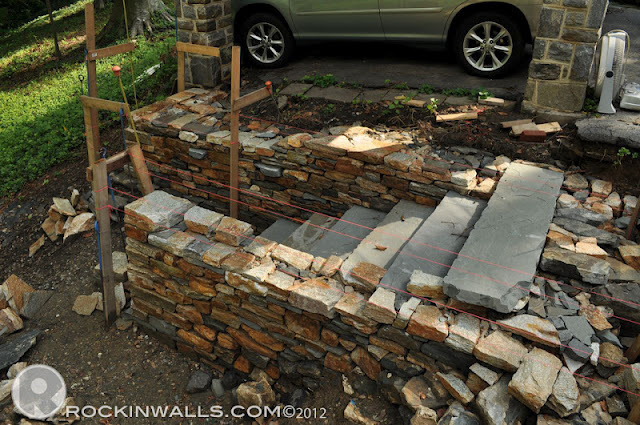 Yup that's right I don't want to move the stone more then twice. Once I determined how far I was below my master line for example 54" below. I then was able to start my build for my first step. 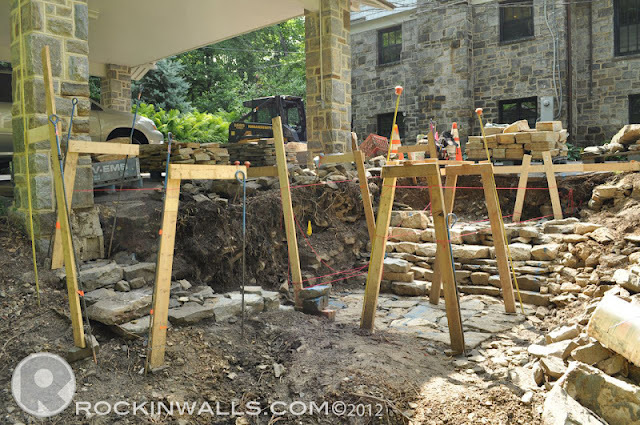 When I started building my wall I started at the back garage pole then around to the spot for the first step. Everything depends on the correct placement of the first step. The will set the full build in motion. If this is off the project is bust!! I begin to build up with small stone for under the PA Blue Stone step. With the first step it must be in the correct place. 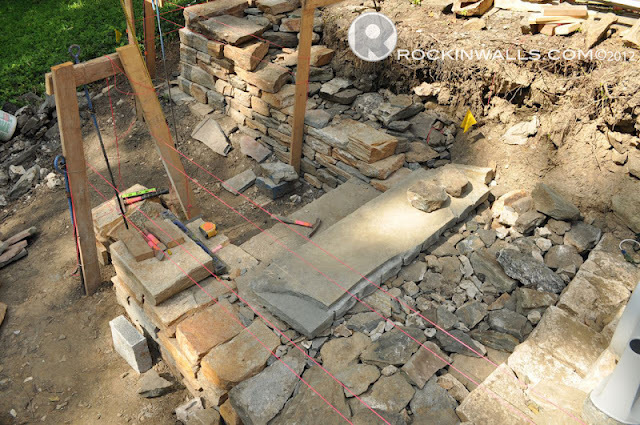 If this stone is not in the right place the hole build could be compromised since this step sets the stage for the build. I used my new/used mini excavator with a new Geith Thumb to set my stones. 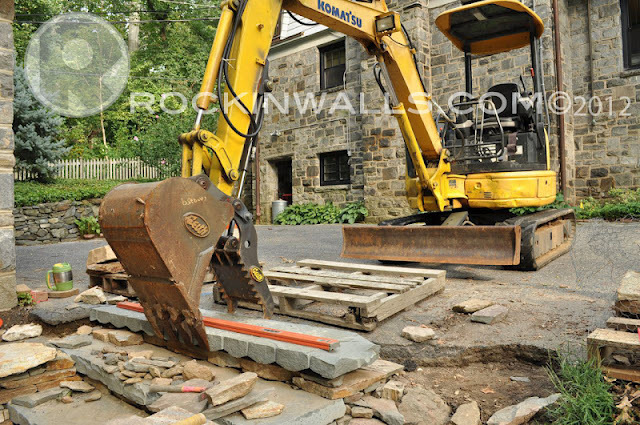 After last year building the Warren Road wall with floating steps I realized how much this machine would do the work of 4 men and then some. With just me operating it. 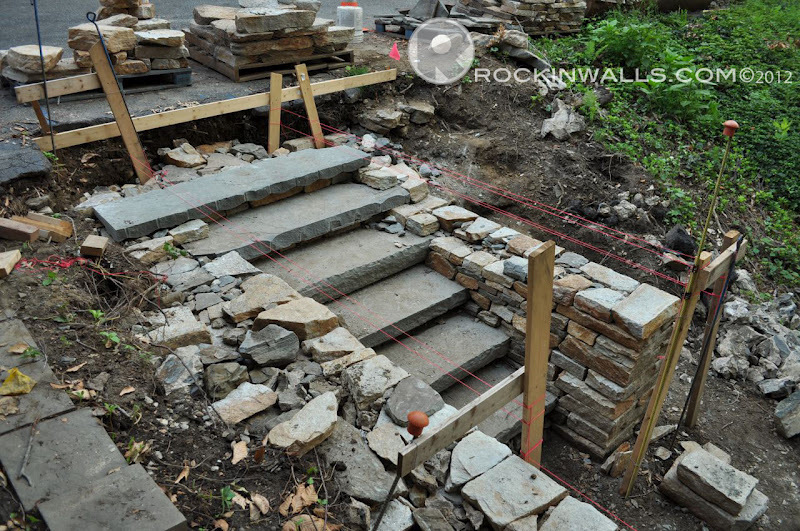 Setting large steps, stones or excavating a the job site. 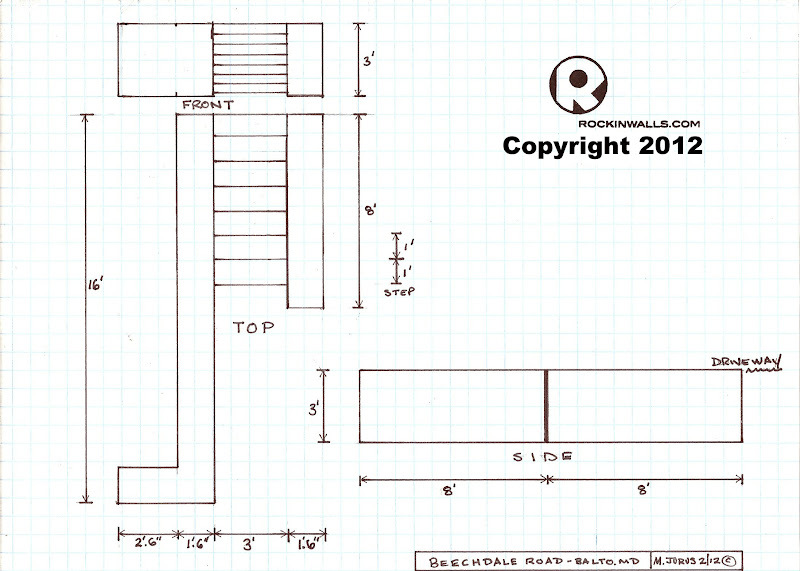 First step will be 3' long with the 8th (top) step 4' and act as a platform. The start of the cheek end /wall head at end of free standing wall. 3rd step now in place. I build back level behind each step as I place them. Then I build up once again to get the desired rise (height) which is 6". My tread (width) is 14"
Little by little I make it to the top of the build. 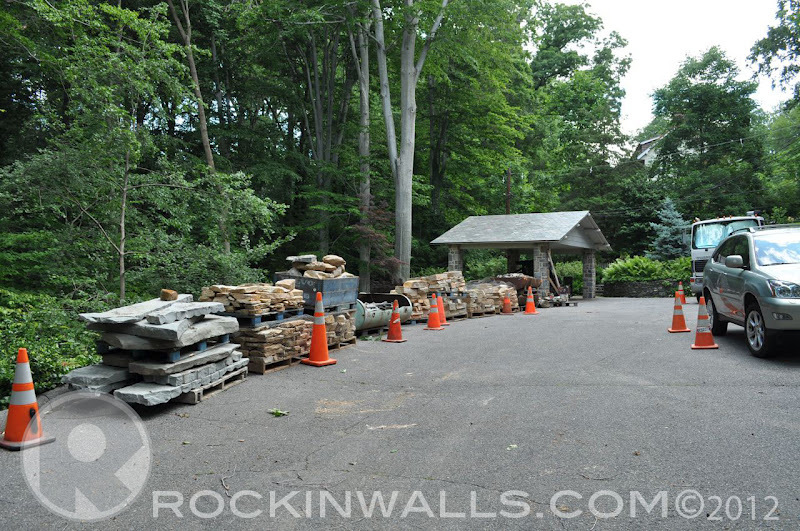 You can now see the Master line ie the horizontal wood board by the driveway. 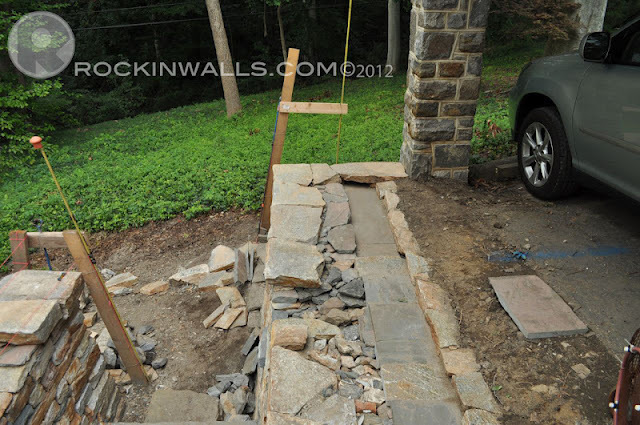 This marks the top of wall at last step, level to driveway. 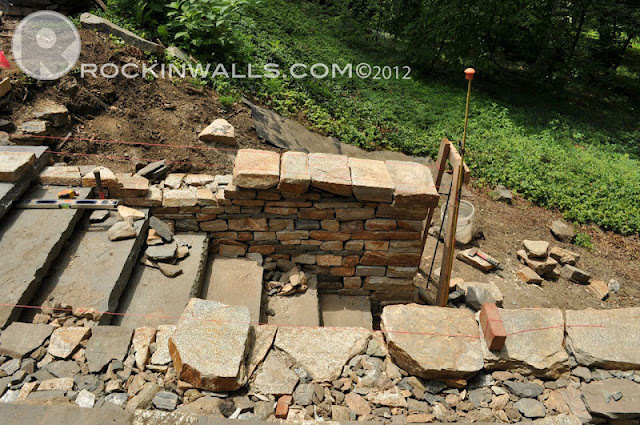 Notice left side wall - retaining wall corner with inter locking stones like dovetail construction in wood work such as furniture ( look in side of any good drawer). Or like taking your two hands and inter locking your fingers. Makes for a very tight lock. 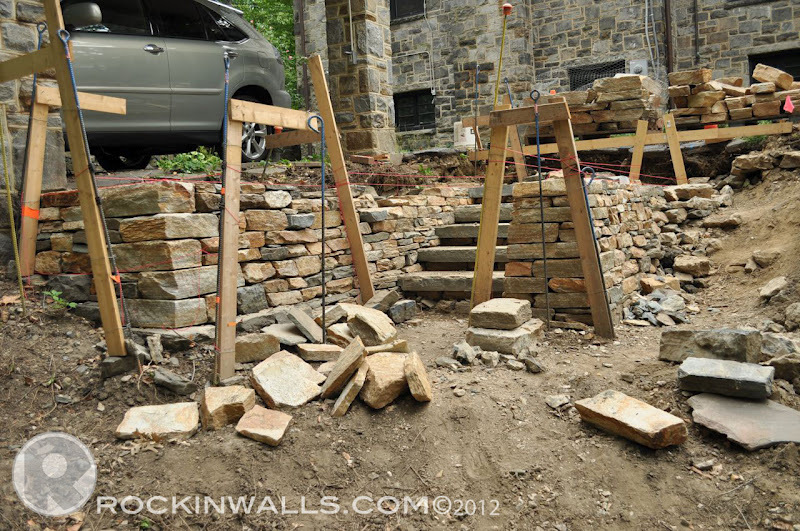 I continue to build up on the full project but mainly the steps. One at a time. One day when I was working in the rain I realized the rain was coming right into my wall. 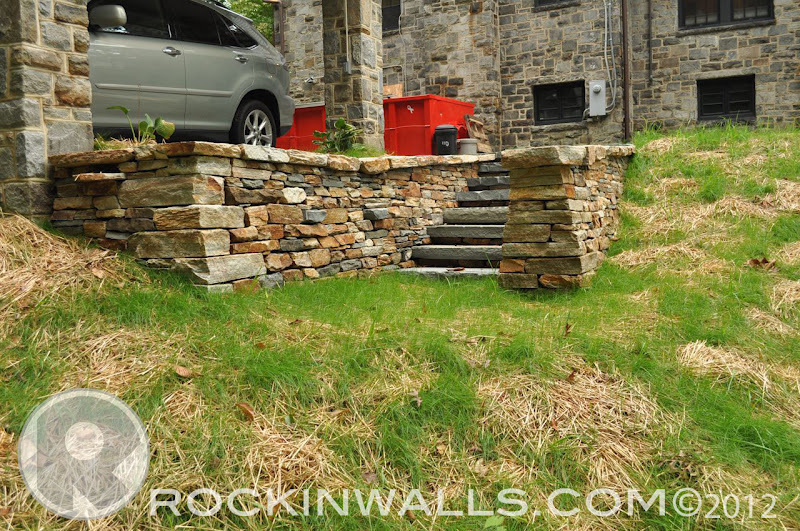 (best thing about working with dry laid stone-can't do that with mortar!) One thing I had never looked at was up. I didn't realize that no gutter was on the carport. Don't know why I didn't think of this. 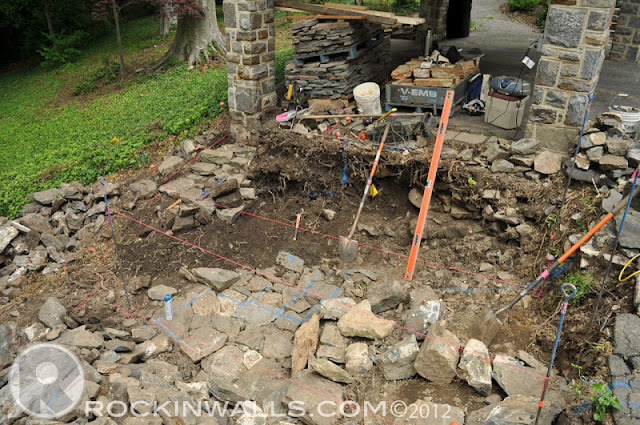 I believe I was so focused on the integrity of the structure as I took the old wall out. I never gave a thought. Why not? Because I can! Rain gutter being built. I used small Butler stone as the edging closest to the car port. I begin to put the cap stones on. You can see at the end of the rain gutter the cap goes over. I use PA Blue stone to loosely finish off the back side with the cap stones by the gutter. 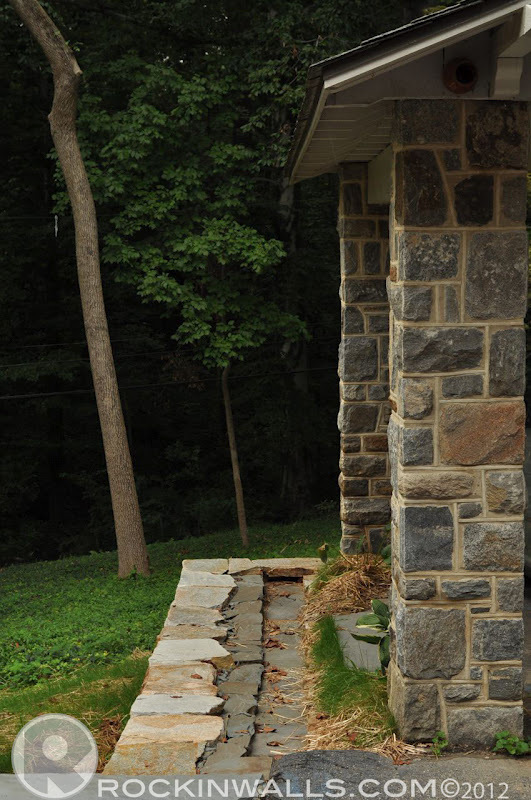 The cap stones at the outer upright pillar are -10" below the Master line. I build my caps level all the way around to steps. The free standing wall also has one level cap. 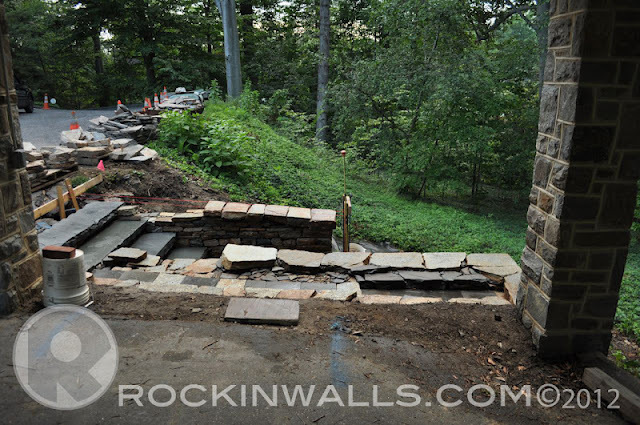 After the level caps on both sides of the wall they head up hill toward the driveway. 1 Potato 2 potato 3 potato - sorry just caps stones one by one I work to the sting line to make sure they are headed up hill in the same directions. You'll notice the wall on the far side is not built all the way up. The reason for this is as I work back I can find the stones I need to get to the needed height to set my caps at the correct level and angle. Remembering you still need to build level as you go up hill. Only stepping the stones to get the angle you need. Tricky tricky tricky. 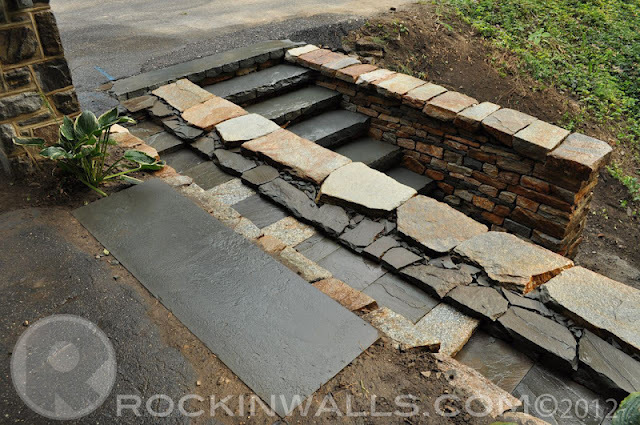 But saving all those small flat stones will now come in handy. 7th step now goes in. I will now have to remove all my frames to finish the build. I have enough of the wall built to know where my I need to go. I will have to finish the last part of the build all with my eyes and believe in my instincts. I find it easy some times to fall into the trap of relying on tools like a tape measure to second guess my brain. When you take the time to believe in yourself and follow your nose - I mean your brain you will find the answer quicker then you may have walking around with the tape measure. But this is very difficult for two reasons. Trusting yourself instincts and turning off your brain. As I call it letting my hair down. Go with the flow. Ya good luck with that one! Last step goes into place. Finished wall with rain gutter. You'll notice the top of the cap stones come into the top step. 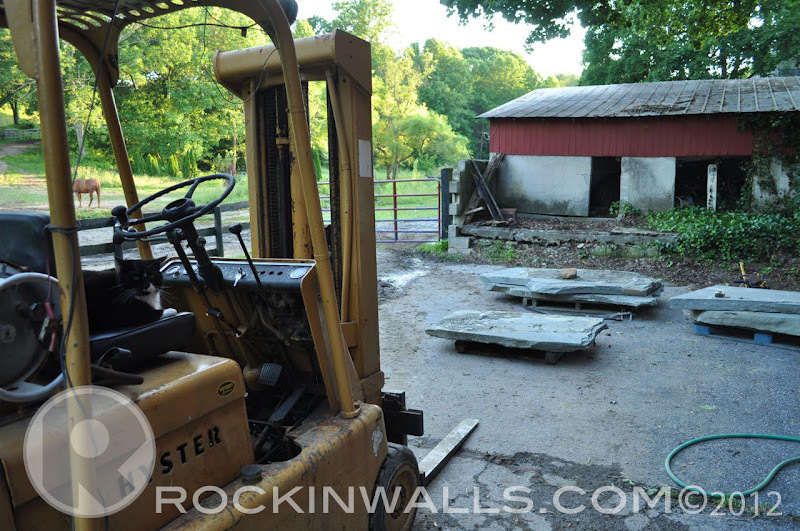 This will keep any one pushing snow with snow plow from pushing the cap stones off the wall. 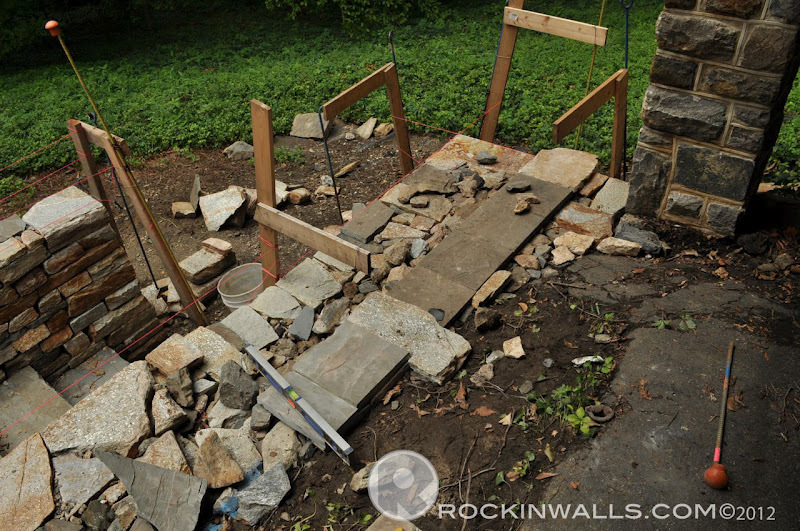 They will have to take out the top step to take out the wall. But hey if that happens - I know a great waller! 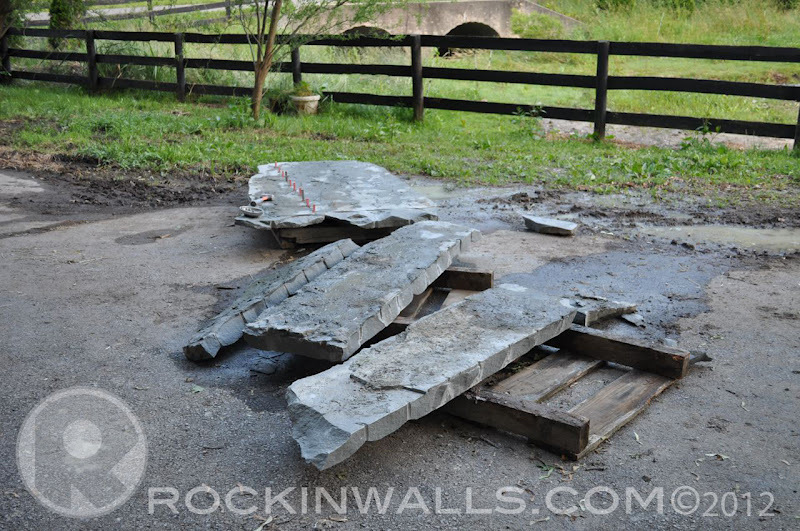 Since the wall is dry laid stone I can put them all back with out any problems. Might just take a little time remember where each one goes. 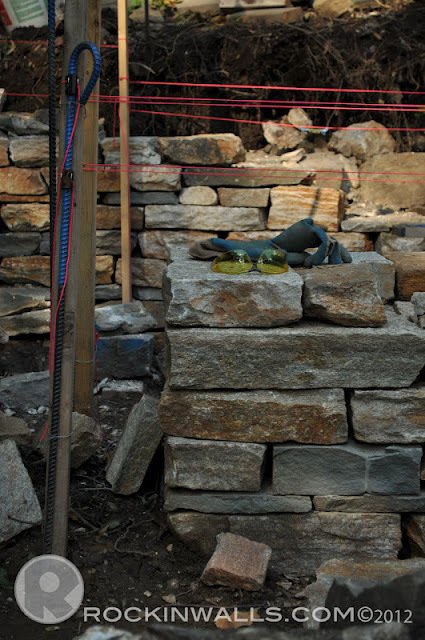 Good thing I numbered each stone. 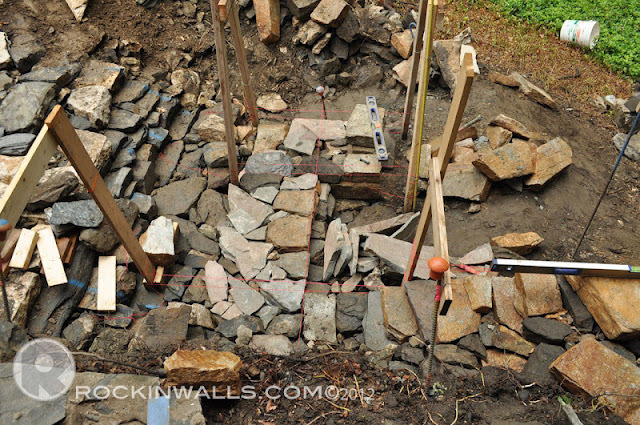 I love walling by numbers. 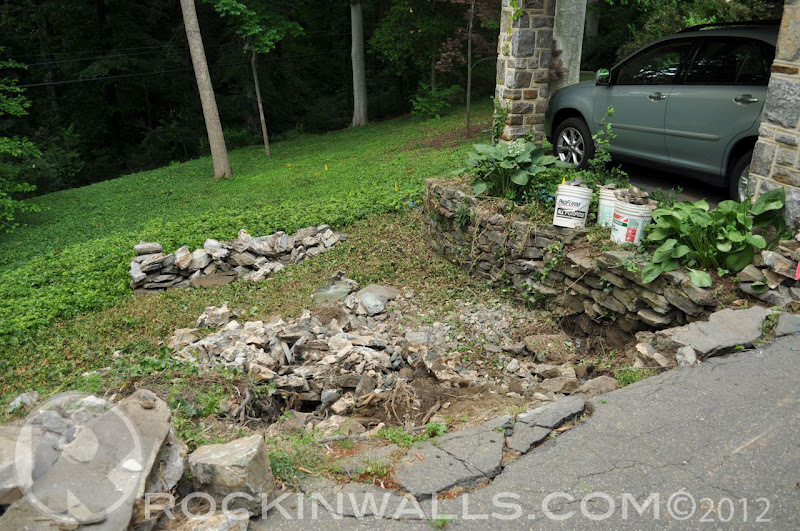 I replaced all the small stones the home owner used to use to step out of their car. 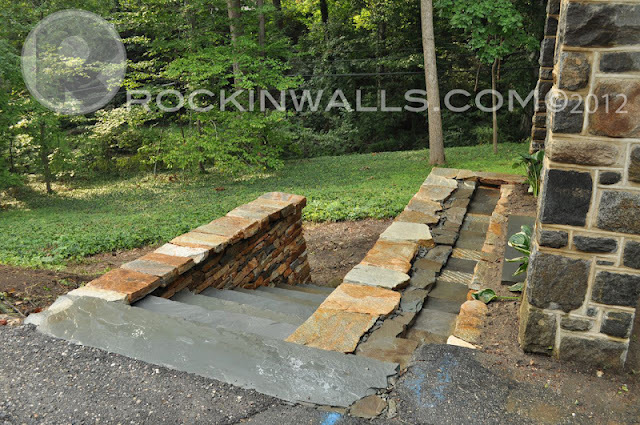 With a 5'.4"x20" PA Blue Stone tread / second. The stone had a small chip so I saved the home owner a considerable amount of $$. The stone due to the size was only set on earth and set parallel to the carport blacktop. 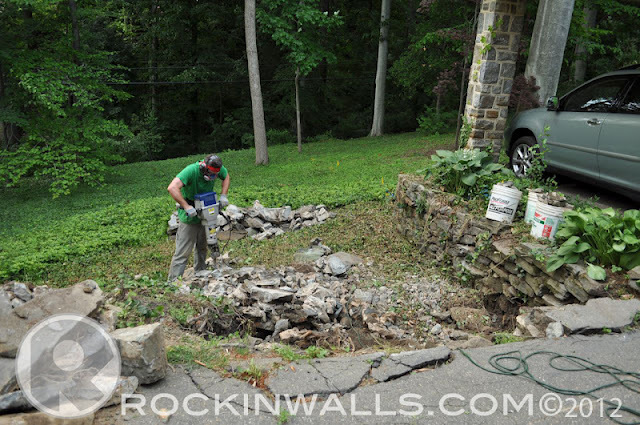 Now the chances of weeds coming back are minimized by such a large stone. I had to bring this to the job site in the back of my Kia Soul. When my truck was out of commission. Road Safety Accidents- Do you have a Safe and Secure Zone? 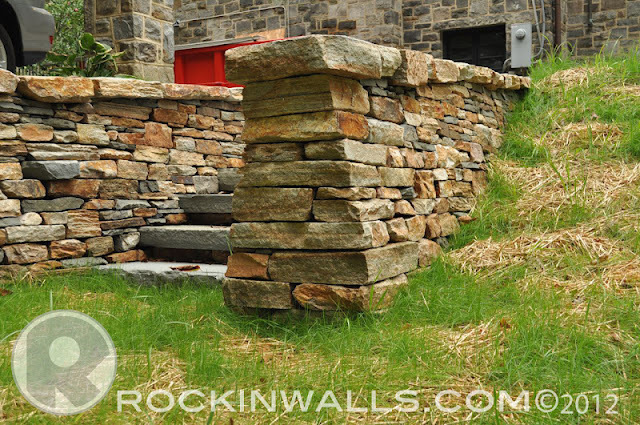 Thank you for taking the time to follow my blog and my joy for stone walling. If you made it this far you've read the longest blog to date. Great work Mark! 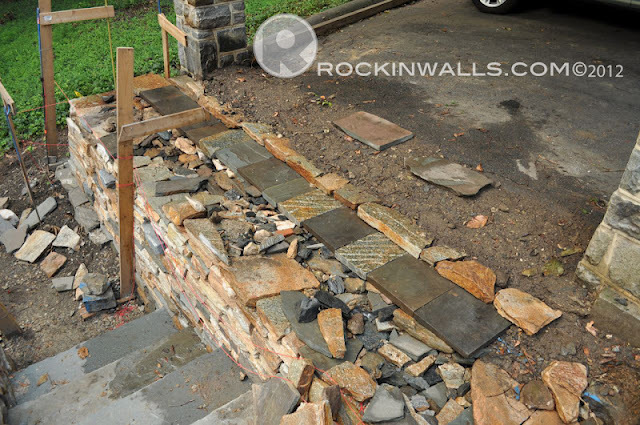 The wall/step project looks great, and you did a really thorough job on explaining everything in a step-by-step manner. Keep up the good work, both stoning and blogging! Thank you Clark, You know I'm not much for letting any job off easy. This did take a little time just due to the complications, I truly enjoyed this job - I like the step by step thats a classic- good one! Thank you for the kind words on the stoning and blogging. Beautiful! You've inspired me to get back to my own blog.